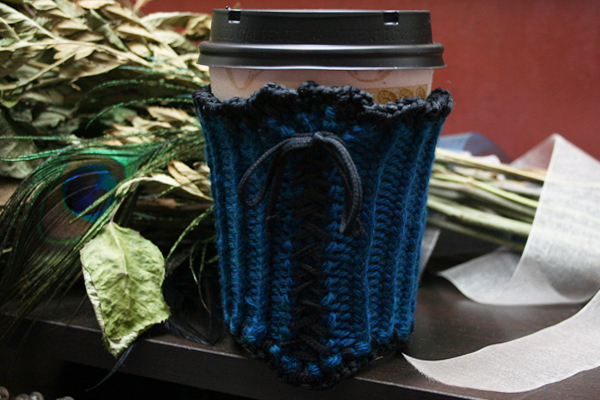 Just because *I* don’t dress like a floozy, it doesn’t mean my coffee can’t get a little fancied up 😉 I like making coffee cozies, and one day when I was bored, this formed on my needles. Since I get a lot of compliments on it, and a lot of hints from friends that they would like one, I decided to jot down the rather simple pattern. As with all my patterns, I’m not restricting what you can do with it, other than asking that you not claim you invented it (because that’s not nice!) If it’s possible to credit me as the designer, please do so – but no, I don’t expect you to invoke my name every time you give or sell one of these!